Every now and then I read a book that causes me to change how I think in some fundamental way. One such book was Start with Why by Simon Sinek. (To get a condensed version of the main preachings of his book, watch this TED Talk). While most — including Amazon — merely categorize it as a business book, I believe Start with Why has far broader relevance. It’s actually a lesson in how to communicate any message in a more sticky way. 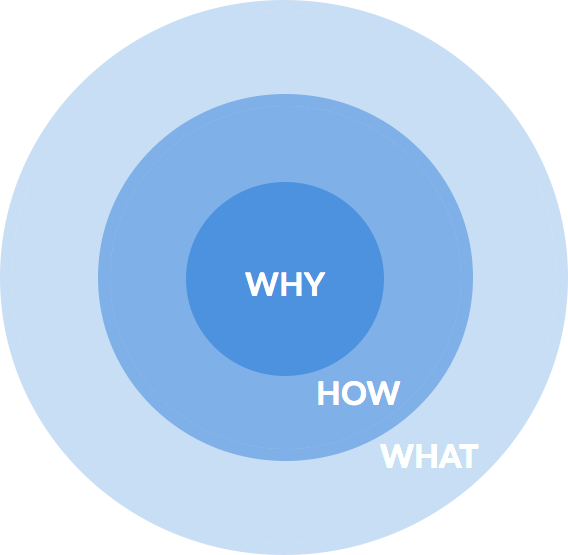 In the book, Sinek introduces what he calls the Golden Circle: 3 concentric circles labeled WHY, HOW and WHAT, respectively. We sell great mobile phones [WHAT]. They have beautiful screens and great battery life [HOW]. Buy our phones. It’s an approach that describes most of the marketing messages we hear today and have heard for decades past. There’s nothing inherently wrong with this approach. It works fine. In fact, anecdotally speaking, I might even suggest that the directness of this approach may actually be preferable when marketing a category of product that hasn’t existed before. You’re getting rejected because you smell. Buy our anti-perspirant. It’s better than your deodorant because it doesn’t just neutralize smell, it stops sweat altogether. 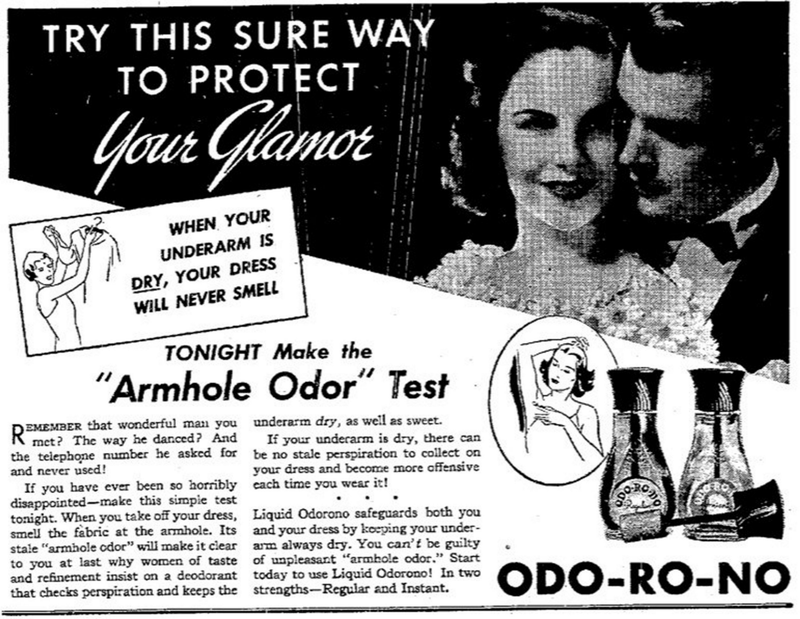 It’s possible the makers behind Odo-Ro-No had a life-long passion for helping people feel more confident by making sure their armpits were less smelly. But I’d argue that it’s less necessary to convey that here. This ad is actually educating consumers (specifically targeting females here) about what an anti-perspirant is and why it’s functionally different than a deodorant. Fast forward a hundred years into the 21st century, and we are now bombarded with marketing every day. Many of us are so tired of ads that we’ll even pay money to not see them! Furthermore, consumers are orders of magnitude more informed. We don’t need a company to tell us what we need and how to find it, we’ll Google and learn about our options ourselves (see my post on Information Symmetry for more thoughts on this topic). What Sinek contends is that the most effective people and organizations actually communicate from the inside-out. They tend to start with Why (i.e. “We believe that every person has the right to use the Internet securely”), then follow with How (i.e. “So we develop technology that makes the world’s most sophisticated security algorithms accessible to all”), and only lastly do they tell you the What (i.e. “We sell VPN solutions”). A wonderful example of what it means to start with why is this internal presentation by Steve Jobs as he launches the Think Different campaign soon after his return to the helm of Apple. If more brands communicated their vision in this style, maybe people wouldn’t have such a distaste for advertising! We are here to find meaning. We are here to help other people do the same. Everything else is secondary. We humans want to believe in our own species. And we want people, companies and products in our lives that make it easier to do so. That is human nature. Product benefit doesn’t excite us. Belief in humanity and human potential excites us. Think less about what your product does, and think more about human potential. What statement about humanity does your product make? The bigger the statement, the bigger the idea, the bigger your brand will become. My interpretation of this is that, for better or worse, we live in an age of abundance (obviously I’m excluding folks who are living in poverty). Our basic needs are met many times over. More than ever, we now seek meaning in ourselves and in the world that’s unfolding around us. It’s the top of Maslow’s Hierarchy of Needs: self-actualization. Accordingly, we want as many products that touch our lives to help us attain our highest level of meaning. So when we come across a brand who’s purpose aligns with our own, we are drawn to it. We are loyal to it. We’ll even find ourselves defending that brand when others malign it in our presence. And it’s for that same reason that great brands enjoy better gross margins, higher NPS, lower churn and lower acquisition costs than their competitors. A critical mistake would be to think of Sinek’s Golden Circle as a marketing framework, only useful for communicating with your customers. Rather I believe that this style of thinking and communicating is critical to both inspiring and aligning everyone that touches your organization: employees, partners, and customers alike.